Flappy Bird was one of the most successful games of the last year. A game so addictive and so successful, the developer took it down from the app stores. But don't worry, the fun continues anyway! 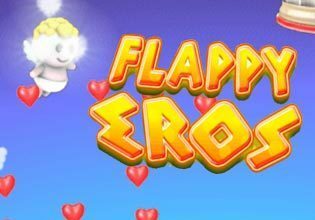 Now here is the all new Flappy Eros a masterpiece that takes the "easy to play, but hard to master" concept to a whole new level. This time you play as Eros, a cherub and there are helpful extras that protect you and will help you to get further and further.Try to go as far as you can, collect as many hearts as possible, but be careful not to hit the pillars in your way. Fly away, far away!